Science Signaling 27 nov 2012; 5:252. S Esnault, RK Braun, Zhong-Jian Shen,Z Xiang, et al. culminate in maximal cytokine mRNA production and stability. can be antagonized by interference with the cis-trans peptidyl-prolyl isomerases (PPIase), cyclophilin A and FKBP. which are essential for the stabilization of cytokine mRNAs are largely unknown. mediates the post-transcriptional regulation of Th1 cytokines by activated T cells. protein expression after cell activation. reducing the expression of IFN-γ and CXCL-10. cyclosporine A and the Pin1 inhibitor, juglone, was synergistic. These data suggest Pin1 inhibitors should be explored for use as immunosuppressants and employed with available calcineurin inhibitors to reduce toxicity and enhance effectiveness. Velusamy Rangasamya,1, Rajakishore Mishraa,1, Gautam Sondarvaa, Subhasis Dasa, et al. an essential and novel regulatory mechanism for protein phosphorylation. crucial for its normal nuclear functions. Pin1 is commonly dysregulated during oncogenesis and likely contributes to these pathologies; The mechanism by which Pin1 catalytic activity and nuclear localization are increased is unknown. to increase its catalytic activity and nuclear translocation. promotes cyclin D1 stability and centrosome amplification. is localized in the nucleus. 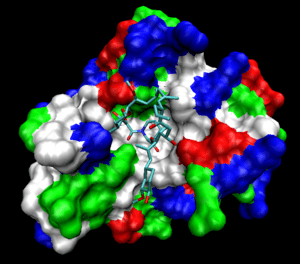 a phosphorylated Ser or Thr residue (pSer/Thr-Pro) (1). its expression is diminished in AD brains (2). and thus function are regulated by posttranslational modifications (2). consistent with its substrates being involved in transcription and cell-cycle progression. It was recently reported that Pin1 nuclear import is regulated by a novel nuclear localization sequence in the PPIase domain, composed of basic amino acids (9). Nonetheless, the detailed mechanism that regulates Pin1 nuclear translocation is still not known. It also remains unknown whether any posttranslational modification of Pin1 can regulate its nuclear translocation or catalytic activity, and therefore directly affect its function. Andrew T. Namanjaa, Xiaodong J. Wangb, Bailing Xub, et al. found in numerous signaling proteins regulating cell growth and neuronal survival. locked in the cis and trans conformations. produce different mobility in Pin1. connecting the domain interface with the isomerase active site. produces a weaker conduit response. alter binding properties at the remote peptidyl-prolyl isomerase active site. specific input conformations can gate dynamic changes that support intraprotein communication. Such gating may help control the propagation of chemical signals by Pin1, and other modular signaling proteins. intrinsically disordered loops of cell cycle proteins (1). either the cis or trans conformation. that propagate the chemical signals governing the cell cycle. to ensure proper signal routing. S/T (de)-phosphorylation, change the cis-trans equilibrium. accelerating the approach to the new equilibrium (1). 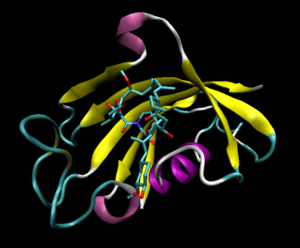 peptidyl-prolyl isomerase (PPIase) domain (50–163) (Fig. 1). A flexible linker connects the two domains. Both domains are specific for pS/T-P motifs (1). catalysis is the sole province of the PPIase domain. motivating flexibility-function studies of Pin1 (4–6). H Abrahamsen, AK O’Neill, N Kannan, N Kruse¶, et al. isomerization sequence at their turn motif phosphorylation site. priming them for subsequent down-regulation. widely described property of this key family of signaling enzymes. However, neither the mechanism of down-regulation nor whether this mechanism occurs following stimulation by physiological agonists is known. following activation induced by either phorbol esters or natural agonists. one of two C-terminal sites that is phosphorylated during the maturation of PKC isozymes. converting these PKC isozymes into species that can be efficiently down-regulated following activation. The peptidyl-prolyl cis-trans isomerase Pin1 is emerging as an important regulator of signal transduction pathways (1). Pin1 is essential for cell cycle progression (2). Ser/Thr preceding the Pro compared with unphosphorylated peptides (3). regulation of activity and stability. downregulated in degenerating neurons from Alzheimer disease patients, correlating with age-dependent neurodegeneration (5). that are required for downstream effects.